A good dance school should not only teach your child to dance beautifully, it should be fun. Local Mums give their recommendations for the best schools in our area. "I highly recommend�AJ Cheer & Dance�to all Local Mums.�The AJ Classes are EXCELLENT!!! They cater for all ages, my six year old and 12 year old love the Cheer & Gymnastic sessions. Individual needs are met and I have seen a huge improvement in my girls even after just a few sessions. Holiday Camps are a God-send! Four days with a variety of activities to enable children to try it all! Best of all there is a performance at the end of the week to see what the children have been working on. My six year old loves it and my two year old will be giving it a go in October!" "I like�AJ Cheer & Dance�as it is good exercise and I learn new skills. The coaches are easy to get along with and know what they are doing. Amy and Jess are supportive, encouraging and fun to be around. The classes are not just about training they make the classes challenging but fun! I love it!" AJ Cheer & Dance�are a new local school providing dance, cheerleading and gymnastics classes to children aged 2-18 years. We currently run over 30 sessions across the week in various different styles including Street Dance, Ballet and Tap Dance. 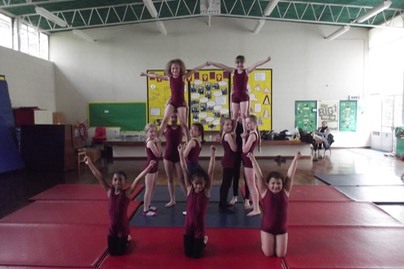 Our Cheerleading and Gymnastics squad team are in training to compete at national cheerleading competitions next summer! We are in over 10 schools offering breakfast and after school clubs around Putney and Wandsworth. We also run holiday camps throughout the school holidays which are always very popular! Our aim is to try and get as many children as possible involved in physical activity in the comfort of a safe and fun environment. We aim to keep our prices as low as possible in order to maintain accessibility from all families! If you would like to involve your children in any of our classes please contact us for more information.